If the garage is cooler than 50 degrees, or if the plant won't get much light there, it would do better indoors. In that case I think the southeast corner would be the best spot. Don't fertilize and water sparingly during the winter. 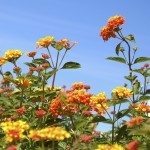 This article explains the issue of trimming back lantana. If yours will be inside, you don't need to worry about winter damage, so trimming in fall would be fine too.